So the DOTS Bonus Edition photos keep rolling in from every direction- and I'm doing my best to post them all- but the stockpile of car photos from Denver has reached absurd proportions. First there was Kitt on the south side, then EJacobs started shooting interesting old cars in the northwestern part of town; by this time I have a backlog of a dozen vehicles from each of them. To add to the fun, I get shipped to Denver for work every few months, so I can add my own photos to the list! Today, we've got one set of photos each from Kitt, Ejacobs, and me. The unifying theme: Old Fords! Make the jump for three more big galleries. First up is what appears to be a '40 Ford Mercury with a towbar semi-permanently attached. It looks like it runs under its own power, so perhaps it lives behind a giant RV most of the time; bet that makes an impression at the campground! The chainsaw manual on the front seat is an interesting touch. Now here's a pack of three Ford products- technically, two Fords and a Lincoln- that live together in EJacobs' neighborhood. 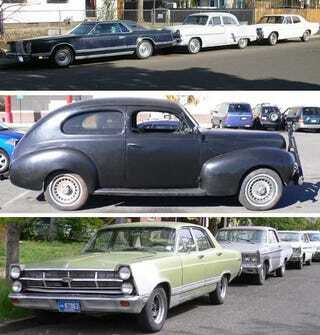 Looks like we've got a '68 Fairlane 500, a '53 Ford, and a '77 Lincoln Continental Mark V coupe. Fords from three different decades, and virtually no parts interchangeability! Last up are some photos of a matched set of three Fairlane 500s, clearly owned by the same person. It seems to be a Denver tradition to own three similar old cars and park them on the street, and the owner of these Fairlanes might well have more of them stashed in the garage and/or the back yard. I believe we're looking at two '65s and a '67, two coupes and a sedan. The rough-looking '65 in the middle is clearly the hot rod of the trio, with traction bars, dual exhaust, the half-Cragar treatment, and a floor-shift manual transmission. It's got 289 emblems, but there's no telling what's really under the hood; let's hope it's a 427! Full-Size 1973 Mercury: Best F——n&apos; Car Ever Made!